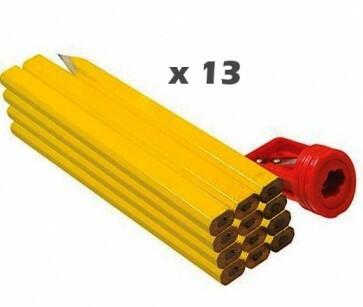 Brand New 13 Piece Woodwork Carpenters Marking Pencil set with Sharpener Soft-lead oval-section carpenters pencils for marking timber, brick, stone and other building materials. Draws thick or thin lines on both rough and smooth surfaces. Oval-shaped length means pencils do not roll away when placed on inclined surfaces. Includes 12 pencils and sharpener.